My project required getting processing skills over a period of time. I have been using Photoshop for years, but attending imaging conferences has helped in the past so I have summarized some of these experiences. When I started the Sharpless Project I also wanted to talk about some of the processing methods I used to create the images. Most of these objects are very faint but most of them do very well with the hydrogen-alpha filter in a reasonable about of time. 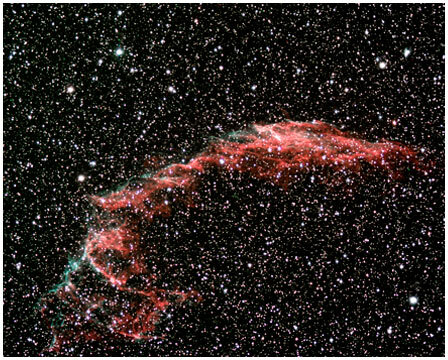 The deep contrast of this filter allows them to show fine structure while at the same time reveals the fainter nebula which is usually lost using a wide band red filter. The color filters used for the red, green, and blue are another story. While some Sharpless objects are very bright where a simple RGB image is more than is needed to create a nice image, there are others that are so faint that only a little comes through even with a red filter and nothing with the green and blue. For these objects, a composite is needed. Some time ago I came across Robert Gendler’s web page on a method of colorizing a black and white H-Alpha image with the color RGB channels. The problem with this kind of image is that the hydrogen-alpha channel is overwhelming compared to the limited detail of the regular color image. Robert’s method found on on his web site uses the H-Alpha channel blended into the red channel to create a new RGB image. Then takes a new version of the H-Alpha black and white image and uses that as a luminance layer in Photoshop. This works very well and I still use this method today. Another method which was discussed by Chris Schur at the Advance Imaging Conference in 2006 adds an additional step in which the hydrogen-alpha channel is blended in with the blue, which helps the H-Beta in the nebula add the needed color to help avoid a pink color nebula. This procedure helps return the color the the RGB showed a hint of in a fairly simple way. Both methods work well and I have not gone into extensive detail, but this process can be found on their Web site.